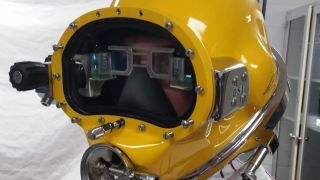 The United States Navy is working on a helmet with a head-up display that will make diving missions safer. The Navy calls the new system the Divers Augmented Vision Display, or DAVD for short. It provides high-resolution real-time imagery to divers to help navigate treacherous conditions. "Having real-time operational data enables [divers] to be more effective and safe in their missions -- providing expanded situational awareness and increased accuracy in navigating to a target such as a ship, downed aircraft, or other objects of interest," says the Navy. The helmet's display is mounted inside and should provide capabilities similar to Tony Stark's Iron Man helmet. "You have everything you visually need right there within the helmet," says Underwater Systems Development Project Engineer Dennis Gallagher. Unlike Iron Man, divers will have to rely on people topside to alter where data is positioned on the display. The dive helmet and augmented reality display are just the first step towards development of state-of-the-art diving equipment for the Navy. Navy engineers are also looking to miniaturize high resolution sonar to help enhance a diver's visibility. The idea is to allow divers to see around them in near-zero visibility. Simulation testing for the augmented reality dive helmet will begin October of this year. The Navy expects to have a working unit to field test in 2017. The technology will trickle down eventually to commercial divers and first responders, according to the Navy. "We constantly engage with the operators; if there is a vision they have, we can make it happen," says Gallagher. "By having this type of positive on-the-spot feedback, you know you're going down the right road."